Peru's capital and the most important city of America, is located in the central coast, along the Pacific Ocean. It has more than 8 million people, made up of different races of the world. Nowadays is regarded as the political, cultural, financial and commercial country. Internationally, the city ranks fifth among the largest cities in Latin America and the Caribbean. It was founded on January 18th, 1535, by the conquistador Francisco Pizarro, under the name of the City of Kings, was the capital of the Viceroyalty of Peru and the largest and most important city in South America during the Spanish regime. The historic center was declared World Heritage Site by UNESCO. Lima is a city with great cultural diversity that is why there are a large number of museums. Another relevant topic is its cooking that managed to be recognized worldwide through the years. Lima offers a wide range of restaurants and bars, where you can taste delicious Peruvian dishes and drinks. In Lima you will find everything you are looking for as cultures, adventures, beaches, dining, entertainment and everything you can imagine. Different civilizations were established such as the Chanca and Maranga. Sanctuaries as Lati, now Puruchuco, and Pachacamac, the main sanctuary of pilgrimage during the time of the Incas, were built. These cultures were conquered by the Wari Empire. When the importance of Wari went down, local cultures became independent again, and one of the most important of those was the Chancay culture. In the fifteenth century, these territories were incorporated into the Inca Empire. At this timeline we found plenty of huacas such as Huallamarca Pucllana, Mateo Salado and Pachacamac. In 1532, Atahualpa was taken prisoner in the city of Cajamarca, in order of Francisco Pizarro. Although a rescue was paid, he was sentenced to death. Francisco Pizarro was appointed as governor of the lands he had conquered. Pizarro founded the capital in the valley of the Rimac River; he thought it was in a strategic location, close to the coast to build a port. On January 18, 1535 Lima was founded with the name City of the Kings, the Plaza de Armas, the Viceregal Palace, now the Government Palace of Peru and the Cathedral were built. In the following years Lima became important when it was designated capital of the Viceroyalty of Peru and the next century, was the center of an extensive trade network which integrated the Viceroyalty with the Americas, Europe and East Asia. Some events happened as the 1687 earthquake that destroyed much of the city and the presence of pirates in the Pacific Ocean, for that reason that the walls of Lima were built between 1684 and 1687. In 1820 an expedition of argentines and chilean led by General Jose de San Martin landed in the south of Lima, but they did not attack the city. Viceroy José de la Serna was forced to evacuate the city in July 1821, fearing a popular uprising; the City Council invited San Martin to enter the city by signing a Declaration of Independence to his request. When General San Martin proclaimed the independence of Peru in 1821, Lima became the capital of the Republic of Peru. Through the years Lima had a steady urban growth that resulted in modernization. In 1868, the walls that surrounded it were demolished creating the first major avenues such as Paseo de la Republica, Leguia, now called Arequipa, Brazil and the Salaverry also the Venezuela and Colonial avenues. During 1950, the Ministry of Economy and Ministry of Education, Ministry of Health, the Ministry of Labor and the Hospital Insurance and Employee Workers and the National Stadium were built and several large housing units. The inhabitants of the interior began to immigrate to the capital which caused an urban expansion. The new towns were settled on land near the center of which were used as agricultural area. To the west: With the Pacific Ocean and the Constitutional Province of Callao. How to get to Lima? Interconnected by the Panamerican Highway with several cities of the coast of Peru, Ecuador and Chile. To the east, Central Road communicates with different cities of the highlands and the central jungle. 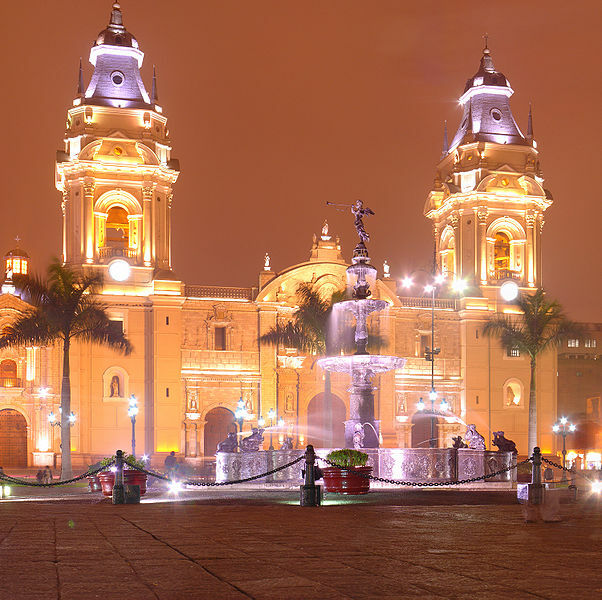 Lima has a high tourism level; the most important attractions are its historic center, its archaeological sites, nightlife, museums, art galleries, festivals and traditions. - Book your hotel or hostel in Miraflores or Barranco, because there you can find the best ones. - Get information about the places that you want to visit. - Take all your documents with you. - Eat meat and fish well-cooked, preferably served hot. - Vegetables should be cooked and fruit should be peeled. - At your arrival at the airport is recommended to take taxis which are inside it, they are more safety. Also you can ask your hotel to send you a transfer, especially if your flight arrives at night. - Try to walk in lighted and crowded areas. - If you need to change money go to changes offices. - You must be careful when you take money, cameras o video with you.